We were meant to go on a field trip to Venales (sp?) a tobacco plantation, this morning at 8:30 but there was a torrential downpour. We were outvoted and the trip was cancelled. Which was a good thing as the morning was a write off. So instead we had a portrait lesson by Mitch in the ballroom. There was water on the floor of the ballroom but luckily there is no carpet in this place… Just stone tiles so they can sweep the water away. Water was seeping in everywhere. There were puddles everywhere on the main floor, undercover and not. We experimented with different lens lengths to see what that does to distort facial features. Quite remarkable. That was the field trip that I missed in the class a few months ago. We had lunch together afterwards (another pizza) and a “light beer” which is only .5 % less than the “fuerte” beer. I didn’t finish it as I would have been too drunk. Two women on the group wanted to go for a walk to see an old home stay family to give them gifts. As it was a Saturday Draga was hoping they would be home. So we went for a walk through the hood. Lots of decrepit buildings, lots of nice buildings, friendly people (we got lost a few times) and I swear I found a tarantula in a hole by the sidewalk. I caught a glimpse of something moving out the corner of my eye, saw the hole then looked in. I saw a large body and fat legs… I was later told there are no tarantulas here but I am going to have to look that up. I am confident that’s what I saw. We found our family and luckily they were home! And what lovely people. Dulce (means sweet) and Marcelo run a home stay. It’s got a lovely view but the neighbourhood is run down. I may recommend it to people I know who want to stay, but it might be for seasoned travellers as they might not be comfortable in the hood. I’m sure it’s perfectly safe. Dulce served me a giant bowl of yummy chocolate ice cream which I couldn’t finish (I felt bad about that) and then she made us a lovely coffee. They have one daughter who lives in California (she got a job at Google!) or maybe that’s her boyfriend who works at Google… not sure. They are both doctors. They visited their daughter in the US. I found out there are charter flights from Havana to Miami (who knew?) but they need permission to go out of the country. They are not allowed to buy one-way flights (lol). Once they are the US, they can buy any internal flights from any airline. 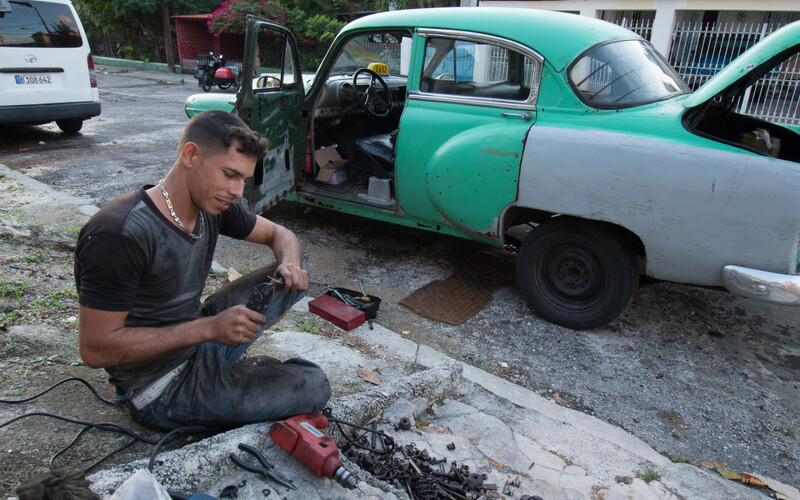 On the walk back I saw a gorgeous young man working on his car so I asked for his photo. Turns out it is a taxi so I asked him for his email to send him the photo… it turned into a ten minute badly translated exchange of addresses and phone numbers. I don’t think he knew what was happening. But he had these light brown eyes which I’m a sucker for. Maybe we’ll hire him for a tour? He speaks very little English. Now I’m just downloading my photos and we’re going to maybe go out dancing tonight.